The Commodity Channel Index (CCI) was developed by Donald Lambert and designed to identify cyclical turns in commodities. CCI assumes that commodities move in cycles, with highs and lows coming at periodic intervals. It is recommended to use 1/3 of a complete cycle as a time frame (i.e. for a 60-day cycle use 20 day CCI). The Commodity Channel Index (CCI) is an indicator which attempts to distinguish between trending and extreme markets. Even though the name suggests it applies only to commodities, it works on any market, from forex to stocks to commodities. Many indicators which determine trend are called directional indicators, meaning they show whether the market is in an uptrend or a downtrend. This indicator is more of an oscillator, as it measures the current price level relative to the average over a specified period. CCI is high when prices are above the average (overbought), and low when prices are below the average (oversold). The indicator was originally designed to identify long-term trend changes but has been adapted by traders to use on all time frames. The CCI fluctuates around the zero line, with approximately 75% of the values falling between +100 and -100. About 25% of the values will fall above +100 or below -100, indicating strong trending markets. The longer the period, the more likely the CCI will remain inside the +100 to -100 range. A shorter CCI (10 periods for example) will be more volatile and provide a higher percentage outside of the range. 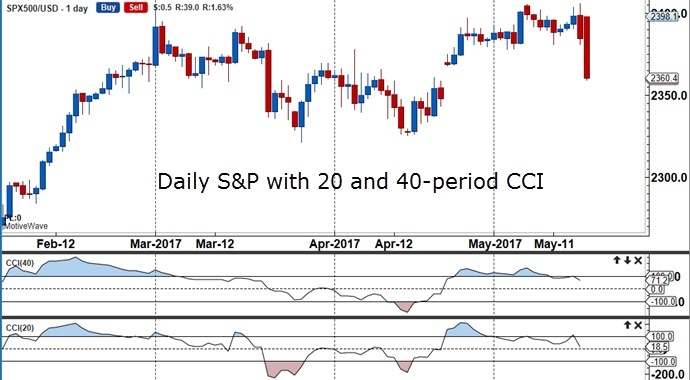 The S&P chart below compares both the 20- and 40-period CCI on the daily chart. On this daily chart, the 20-period CCI dips below -100 twice, but stays within the range on the 40-period CCI, producing less volatility with the 40-period CCI. This illustrates the longer the period in the CCI calculations, the less frequent the trend changes which is why day traders prefer a more sensitive CCI calculation to provide more signals on the smaller time frames. 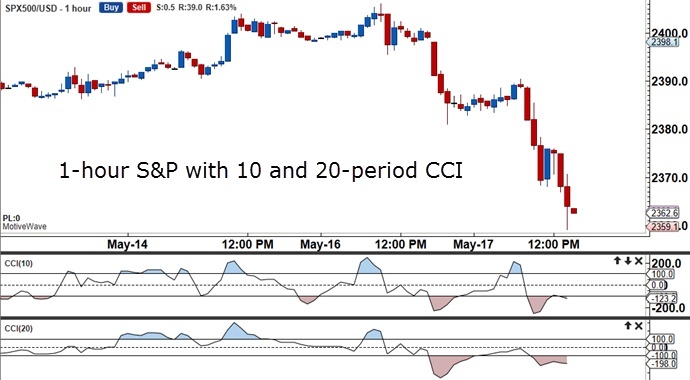 For example, on the hourly chart below, using a 10-period CCI provides more signals than that of a 20-period CCI. While 20-period is standard, the trader can customize the period based on preference. To illustrate this tool, look at the 1-hour chart above of the S&P500 index. 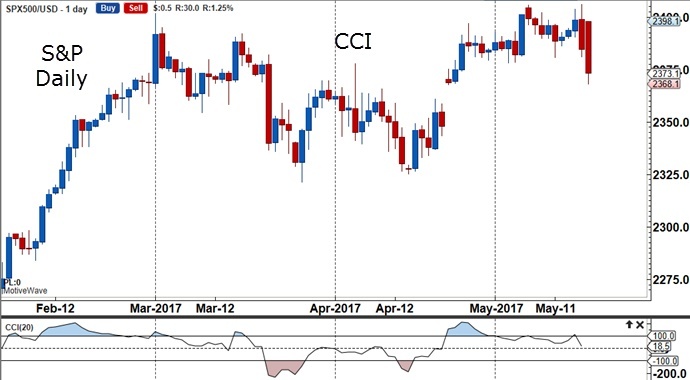 During sideways markets, using the CCI as an oscillator is acceptable, with the strategy of buying when CCI extends below -100 and selling when CCI extends above +100. One way to tell if the market is sideways is to look at the Daily time frame, in conjunction with the 1-hour chart. As an oscillator, the CCI operates as a leading indicator, and signals a reversion to the mean in a sideways market. This indicator frequently shows divergence at market tops and bottoms as well. Used as a coincident indicator, moves above +100 can indicate the start of a bullish uptrend. Again, it is important to look at the larger time frame to make sure this signal is part of the broader trend. For example, the double top on the daily S&P chart above hinted at a market reversal with follow through to the downside on the hourly chart below. The initial sell-off is highlighted with a blue box around the CCI moving below -100. If one makes a call that the sell-off will be greater due to the daily double top, then a trader would look to sell the hourly chart when the CCI moves above +100. In this case, the CCI is used as an oscillator to sell the market when it is overbought in this downtrend. We recommend using a top down approach to trading with the trend as we know that without that higher time frame perspective, it is very easy to get caught up with countertrend moves, and miss the real trend. The challenge is to identify whether the trend will continue or not so combining this indicator with Elliott Wave analysis may be quite useful. Additionally, using trendlines and chart patterns will help to confirm the overall view of the market being traded. 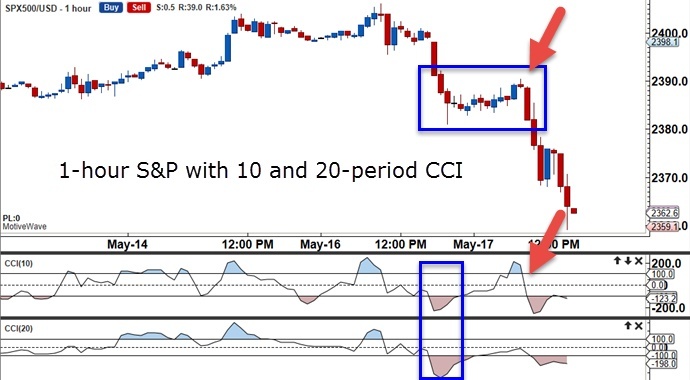 Learn how the CCI helps keep traders in the trend longer, also alerting traders when the market is sideways. Start incorporating the CCI into your chart set-up. Finally, use the CCI in developing trading strategies. This entry was posted in Trading Tips and tagged Commodity Channel Index, market analysis, trading, trading strategy, trading system.